Aidan Keena picks up the first red card of his career for a wild tackle on Bray's Dylan Connolly. WE ALL HAVE our recurring YouTube refuges, and for Hearts and Irish U19s striker Aidan Keena, his are clips of Fernando Torres. These are of the Torres who ran as if his feet could traipse through puddles without making a splash rather than the lumbering Chelsea iteration, who similarly wouldn’t make a splash in a perverse, wouldn’t-hit-water-if-he-fell-out-of-a-boat kind of way. 19-year-old Keena watches these clips every day. “I grew up a Liverpool fan”, Keena tells The42. ”Fernando Torres was my favourite player growing up, so I try to watch him and learn from how hard he worked and how he stuck his chances away”. The Mullingar-born forward now has the chance to make tangible his study at the top of the Scottish Premiership, as Hearts have recalled him from a loan spell at Dunfermline ahead of schedule. Having initially planned to spend the full season with the second-tier club, Keena is now back at Tynecastle with a guarantee of opportunity from manager Craig Levein. “Aidan has come back in because he did well at Dunfermline and I’ll maybe look to use him in the second part of the season”, Levein told the Evening News. “We don’t really have anybody else like him. That’s the reason I brought him back in. He is a little bit different from the other forwards. He has scored a few goals recently and looks like he is playing with a bit of confidence and swagger”. Keena scored four times in 12 games while on loan, and points out what sets him apart from the other strikers at Hearts. “Most of the strikers here are 6ft 4”, big guys. I’m 5ft 11”, so I’m not as big but I have the legs to run in behind, rather than coming to feet and taking the ball short”. He seems to follow the tradition of hard-running Irish strikers, describing himself as a “workhorse” and citing Torres’ goal for Liverpool in a 4-1 win at Old Trafford as his favourite of the Spaniard’s myriad goals, given the work ethic involved in chasing down a hesitant Nemanja Vidic. Having played Gaelic football to county U16 level with Westmeath, Keena threw his lot in with football and combined school duties with those asked of him by Saint Patrick’s Athletic U19 squad, occasionally skipping out on class to link up with the senior team. With five senior appearances for Saint Patrick’s Athletic under his belt and a Leaving Cert in his back pocket, Keena moved to Hearts at the start of least season. 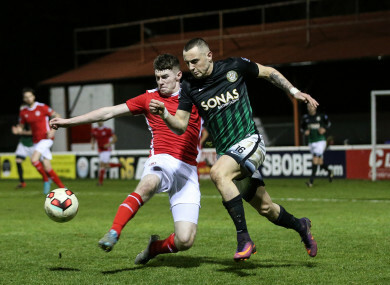 His senior debut for Pat’s began inauspiciously, however: he picked up the first red card of his life in the final minutes of a 2-1 defeat to Bray in February 2017. We were putting on the pressure late on, and then Dylan Connolly broke down the wing for Bray and I just went over and halved him, to be honest. I had to take him down, and at the time I was thinking, ‘right, I’ll just take the yellow’ but later when I looked back at it I thought, ‘yeah, fair enough’. He was running clean through, so I chased him back and took him down. On arriving at Hearts, he was loaned to Queen’s Park in the Scottish second division, where he scored eight times in 12 games. If the frequency of goalscoring was impressive, the quality was even more so. “They seem to do me a favour! I mightn’t score for a few games and then I’ll score a screamer and people forget I haven’t been scoring”. Hearts are fifth in the Scottish Premiership, six points behind leaders Celtic. While Keena admits that Hearts’ injuries in the first-half of the season would have offered him a route to first-team action had he stayed around, he also feels the benefit of regular game-time with Dunfermline. “I’m stronger and fitter, it’s the highest level I’ve played consistently at. Mentally too: I’ve got a lot more confidence playing at that level, week-in, week-out against decent players”. His return to Hearts has brought with it more independence, and he has moved into his own flat having previously stayed in a local family’s spare room. “It’s much better than sitting in digs: you’re in charge of your own food and your own free time, so it’s much better. You don’t want to be living with people who you don’t really know. In terms of digs it was a good digs…but a good digs isn’t that great”. Keena has international ambitions too, having played for Ireland up to U19 level this far. Irish U21 international Jake Mulraney, with whom Keena plays with at Hearts, has told him that he is good enough to force his way into the picture. “He played U21s and reckons I have a bit of a chance. So I’ll keep working hard and hopefully I’ll get the chance. Obviously having been recalled to Hearts, a few games there will do me no harm”. Email “Teenage Irish striker inspired by Torres gets chance to shine at Hearts ”. Feedback on “Teenage Irish striker inspired by Torres gets chance to shine at Hearts ”.